It’s a battle of two NFC North division foes when the Green Bay Packers take on the Detroit Lions. Detroit swept this series last year when Aaron Rodgers was out for the Packers, but Green Bay had won three straight prior to that. The Packers lead the all-time series 100-70-7. The Green Bay Packers allowed the Buffalo Bills just 145 yards of total offense in the 22-0 victory. Aaron Rodgers threw for 298 yards and Kyler Fackrell had three sacks on the afternoon. The Packers got on the board with a little over five minutes left in the first quarter when Rodgers connected with tight end Jimmy Graham for a 3-yard touchdown to make it 6-0. About nine minutes later running back Aaron Jones scored from 3 yards out to extend the lead to 13. A Mason Crosby field goal as time expired in the first half extended the Packers lead to 16-0. In the second half, Green Bay would add two more field goals from Crosby. He connected on a 36 yarder a little less than four minutes into the half, and added a 52-yard field goal, his second of the game, just after the two-minute warning. Rodgers finished 22 of 40 for 298 yards and a touchdown. Josh Allen was sacked seven times for Buffalo. Green Bay is 14th in total yards this season at 269.0 and their offenses 19th at 23.0 points per game. The defense is sixth in the league in yards allowed at 326.2 and they are 11th in points allowed at 20.8. The Detroit Lions had battled back to take the lead with 2:17 left in the game, but the Dallas Cowboys would pull off the victory when kicker Brett Maher hit a 38-yard field goal as time expired to give Dallas a 26-24 victory. That ruined an impressive performance by quarterback Matthew Stafford who completed 80% of his pass attempts for 307 yards and two touchdowns. Maher got the scoring started when he hit a 32-yard field goal to give Dallas the lead. A little over four minutes later, Stafford connected on a 45-yard touchdown pass to wide receiver Golden Tate to put Detroit on top 7-3. In the second quarter, the teams exchanged field goals. First, Maher hit a 43-yard field goal to pull Dallas within one but Detroit kicker Matt Prater hit a 33-yard field goal with 2:50 left in the quarter to extend the Lions lead back to four. With 1:39 left in the half, Cowboys quarterback Dak Prescott through a little past to running back Ezekiel Elliot, who scored from 38 yards out to give Dallas the lead by three heading into the half. Dallas would extend their lead to 10 when Prescott connected on a 1-yard scoring strike to Geoff Swaim with a little less than three minutes left in the third quarter. Detroit would respond right away, as Kerryon Johnson scored from 8 yards out to make it 20-17. 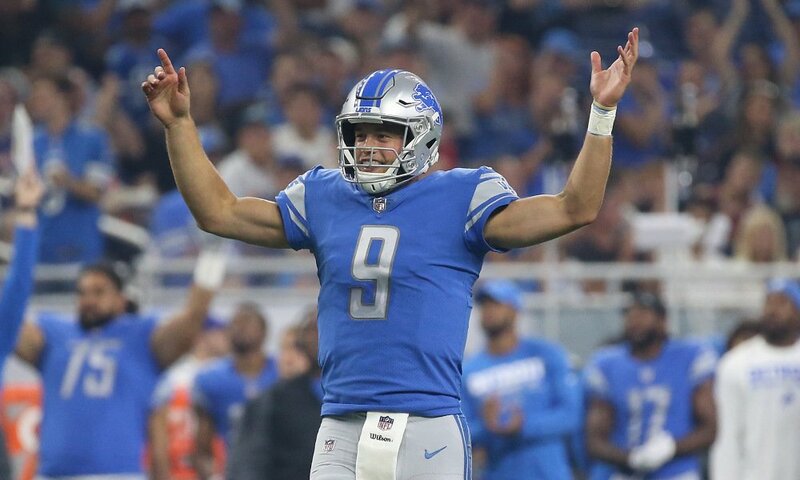 After a Maher field-goal, Stafford connected on the second big play of the game with Tate, this time a 38-yard field goal that gave Detroit a one-point lead. That gave Dallas the ball with 2:17 left in the game. The Cowboys offense moved to the 20-yard line where Maher hit his fourth field goal of the game as time expired to give the Cowboys a 26-24 victory. Detroit enters the contest 11th in the NFL in yards per game and 390.5 and they are 17th in points at 23.5. The defense is eighth in total yards allowed at 329.5 but they are 24th in points allowed at 28.5. 4-0-1 ATS in their last five Week 5 games. 4-1 ATS in their last five games against teams with a losing record. 12-5-1 ATS in their last 18 games in October. 1-5 ATS in their last six games against teams from the NFC. 5-0 ATS in their last five games against NFC teams. 4-1 ATS in their last five games overall. 1-4 ATS in their last five Week 5 games. 1-4 ATS in their last five games in October. The favorite has won 19 of the last 26 meetings between these two teams against the spread. The Packers have been the better team this year, and look to finally be getting themselves in a groove. Detroit has never been much of a match for Aaron Rodgers and he will probably be the difference maker in this game as well. It is for this reason that you should expect the Packers to win. This is a battle of two of the better quarterbacks and the National Football League, and that will likely mean that this game ends over 50.